Tell us a little bit about Dynatect. Dynatect designs and manufactures custom motion and protection for machines. Formerly known as A&A Manufacturing, the company started over 70 years ago manufacturing protective bellows under the Gortite® brand and expanded the product line and manufacturing footprint over the years. Dynatect’s mission is improving human and machine safety, machine uptime, and dynamic protection. We bring reliable, engineered solutions to complex and specialty applications. Equipment protection, particularly flexible covers, represents the largest part of our product portfolio. Bellows are most often used to protect critical components. Actuators used in motion control equipment are often exposed to contaminants ranging from dust and abrasive grit to metal chips and weld spatter. Finished surfaces of cylinder rods, slides, and other mechanisms need protection from these wear-inducing elements. In other cases, bellows might be used around pinch points to reduce the hazard of unintentional contact with machine parts. Bellows are also used as flexible ducting for air exhaust/intake applications, such as traction motor cooling on light rail vehicles. Bellows are used in many industries such as machine tool, medical, and transportation. Two examples are bus bellows and protective skirts around lift tables. The engineering team at Dynatect can utilize more than a dozen bellows construction types and even produce custom hybrid designs when solving customer applications. What material choices are there for bellows? Dynatect offers hundreds of material choices, which are chosen based on the environment – and this is where collecting customer application details is crucial. The application specialists will consider the presence of abrasion, chemicals, liquids, and operating temperatures along with various physical requirements when recommending a protective cover. A bellows is typically made using an elastomer or thermoplastic coated fabric, pure elastomer, or a thermoplastic film. The common elastomers are Chlorosulphonated polyethylene (CSM), ethylene propylene diene monomer (EPDM), chloroprene, nitrile (NBR), Styrene-butadiene (SBR), polyethylene terephthalate (PET), polyurethane, and silicone while PVC and polyurethane are typical thermoplastics. Textile substrates include nylon, polyester, and specialty fibers including para-aramid, fiberglass, and others. Keeping in mind that bellows are essentially wear parts, heavy-duty conditions or extreme temperatures can diminish the useful life of the bellows. In the end, the goal is to prevent unplanned downtime from damaged equipment. Are there any life-cycle extending measures and preventive maintenance strategies for bellows? Maintenance is a key component of preserving bellows type covers. While covers are inherently wear items, cleaning them off, removing debris and ensuring they are functioning on a routine interval will increase longevity. 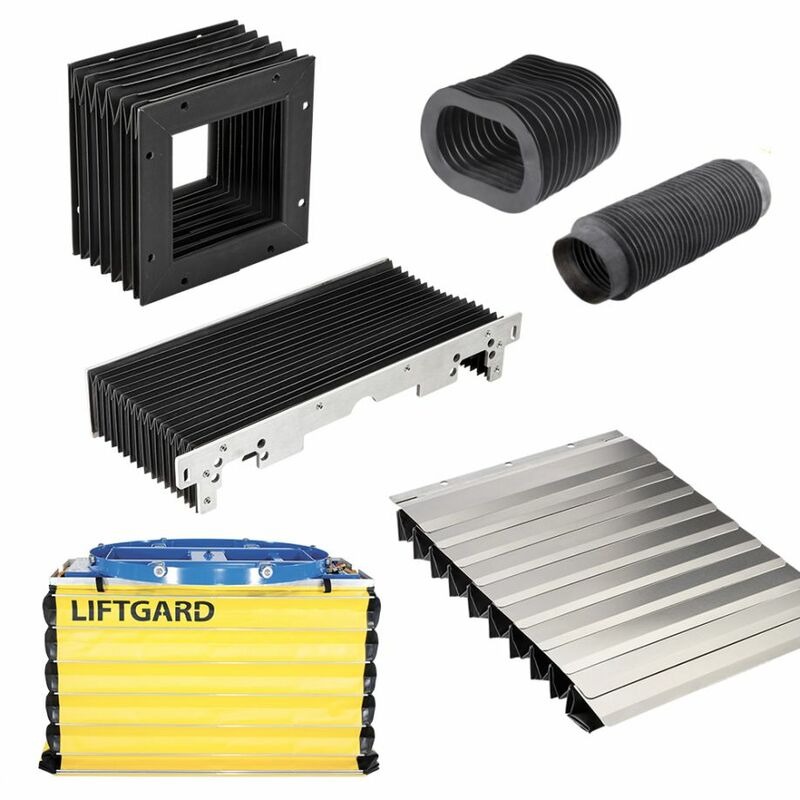 Dynatect can provide accessories that simplify installation and replacement. For example, round shaped bellows can be supplied with a zipper to facilitate mounting to a cylinder or shaft without disassembling the machine. What type of customers does Dynatect work with? Dynatect works with every type of customer, from machine tool OEMs to machine shops as well as distributors. We can assist in the development of a single prototype to the production of thousands of production units. 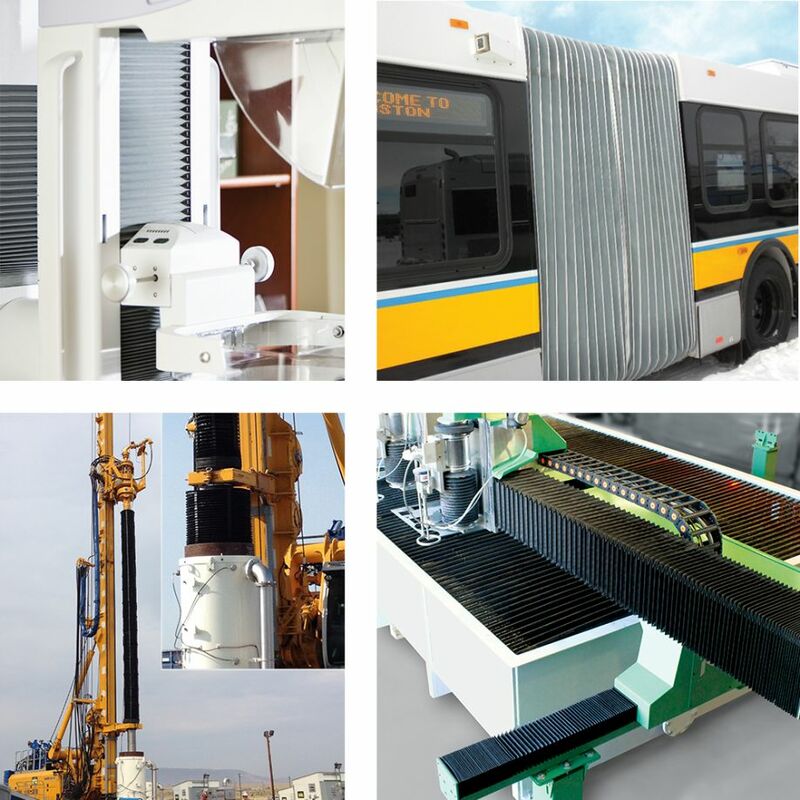 Dynatect continues to expand in the Machine Tool, Transportation, Oil & Gas, Automation and Mining & Energy markets. What benefits do customers realize from Dynatect’s 70+ years of experience in technical design, construction, and production of bellows in any shape or size? Due to the experience and focus on manufacturing protective covers, as well as significant expertise in motion requirements and material characteristics, the team at Dynatect can act as an extension of your engineering team. After receiving the basic dimensions of the part being covered, physical requirements, and the application environment, Dynatect’s Engineers can custom design a solution specifically for your needs. Tips & tricks with bellows: what can be done right or wrong in working conditions? When determining how to apply a bellows, it is critical to understand several parameters of an application: How will the bellows be mounted? Will the bellows be ventilated? What chemicals and debris will the bellows be exposed to? What temperature range will the bellows will experience? Will there be temporary exposure to extreme temperatures? Does the bellows laterally shift, or only extend and retract? What other forms of flexible protective covers does Dynatect manufacture? Dynatect offers roll-up type, sliding plate, and telescoping type metal way covers which are primarily used in machine tool applications. Walk-on duty roll-up covers are used in other industries where a safety pit cover is needed. Humans are working more closely and directly with machines and robots, how is Dynatect addressing to meet the needs of the rapidly changing smart factory? In addressing the high demand for machine safety controls and guarding, Dynatect has recently become focused on smart factory solutions. This includes the VF Automated Machine Safety Door which prevents process generated hazards from interfering with other processes and nearby people. The VF Door can include windows to maintain process visibility while still replacing light curtains. Traditional light curtains require an extra distance buffer to create a safety zone. In contrast, the VF Door eliminates this extra space helping meet the shrinking footprint of automation – allowing more automation in less space.